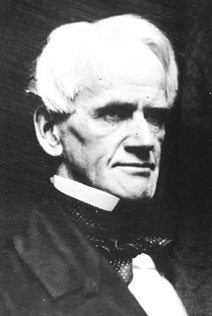 The American educator Horace Mann was born in Franklin, Massachusetts, on the 4th of May 1796. His childhood and youth were passed in poverty, and his health was early impaired by hard manual labor. His only means for gratifying his eager desire for books was the small library founded in his native town by Benjamin Franklin and consisting principally of histories and treatises on theology. At the age of twenty he was fitted, in six months, for college, and in 1819, graduated with highest honors, from the Brown University at Providence, Rhode Island, having devoted himself so unremittingly to his studies as to weaken further his naturally feeble constitution. He then studied law for a short time at Wrentham, Massachusetts; was tutor in Latin and Greek (1820-22) and librarian (1821-23) at Brown University; studied during 1821-3 in the famous law school conducted by Judge James Gould at Litchfield, Connecticut; and in 1823 was admitted to the Norfolk, Massachusetts bar. For fourteen years, first at Dedham, Massachusetts, and after 1833 at Boston, he devoted himself, with great success, to his profession. Meanwhile he served, with conspicuous ability, in the Massachusetts House of Representatives from 1827 to 1833 and in the Massachusetts Senate from 1833 to 1837, for the last two years as president. It was not until he became secretary (1837) of the newly created board of education of Massachusetts, that be began the work which was soon to place him in the foremost rank of American educators. He held this position till 1848, and worked with a remarkable intensity -- holding teachers' conventions, delivering numerous lectures and addresses, carrying on an extensive correspondence, introducing numerous reforms, planning and inaugurating the Massachusetts normal school system, founding and editing The Common School Journal (1838), and preparing a series of Annual Reports, which had a wide circulation and are still considered as being "among the best expositions, if, indeed, they are not the very best ones, of the practical benefits of a common school education both to the individual and to the state" (Hinsdale.) The practical result of his work was the virtual revolutionizing of the common school system of Massachusetts, and indirectly of the common school systems of other states. In carrying out his work he met with bitter opposition, being attacked particularly by certain schoolmasters of Boston who strongly disapproved of his pedagogical theories and innovations, and by various religious sectaries, who contended against the exclusion of all sectarian instruction from the schools. He answered these attacks in kind, sometimes perhaps with unnecessary vehemence and rancor, but he never faltered in his work, and, an optimist by nature, a disciple of his friend George Combe, and a believer in the indefinite improvability of mankind, he was sustained throughout by his conviction that nothing could so much benefit the race, morally, intellectually and materially, as education. Resigning the secretaryship in 1848, he was elected to the national House of Representatives as an anti-slavery Whig to succeed John Quincy Adams, and was re-elected in 1849, and, as an independent candidate, in 1850, serving until March 1853. In 1852 he was the candidate of the Free-soilers for the governorship of Massachusetts, but was defeated. In Congress he was one of the ablest opponents of slavery, contending particularly against the Compromise Measures of 1850, but he was never technically an Abolitionist and he disapproved of the Radicalism of William Lloyd Garrison and his followers. From 1853 until his death, on the second of August 1859, he was president of the newly established Antioch College at Yellow Springs, Ohio, where he taught political economy, intellectual and moral philosophy, and natural theology. The college received insufficient financial support and suffered from the attacks of religious sectaries -- he himself was charged with insincerity because, previously a Unitarian, he joined the Christian Connection, by which the college was founded -- but he earned the love of his students, and by his many addresses exerted a beneficial influence upon education in the Middle West.